Welcome to Pence To Pounds, a new money saving series on Mummy To The Max. Every fortnight I will be bringing you another instalment of my guest series! 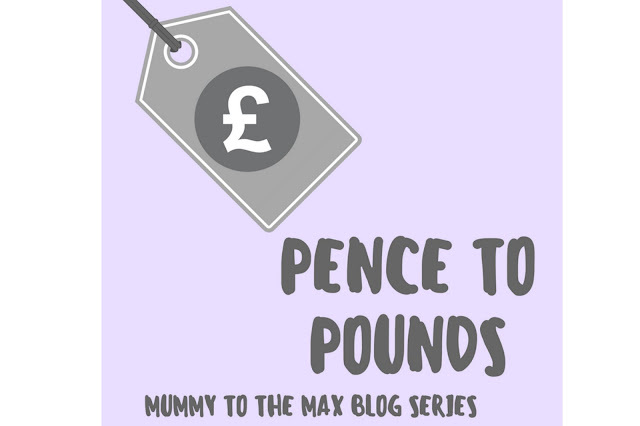 I will be featuring different bloggers each week who all have different money backgrounds. If you are a blogger and would like to take part, please connect with me here. This weeks instalment is from Laura who blogs over at Autumns Mummy. You can check Laura's blog out here. We're a young family from Kent. Both 25, we've been together since we were 16 and are proud parents of Autumn who is fast approaching a year old. When did you start blogging and what is your niche?I've actually been blogging on and off for 12 years. However, I started this blog and started taking blogging seriously in January 2017. What is your attitude towards money – are you a spender or a saver?I'm definitely more of a saver. However, when it comes to my daughter I'm not very good at saving! Have you ever taken part in any money saving challenges? Where they successful?I've done a sealed pot challenge, where you put loose change in a pot for a year. I saved £300 or so, which paid for that year's Christmas presents. What is the best bargain you have bought this year?I got a great haul of clothes for Autumn in a Morrisons sale a couple of weeks ago! ​What is the best budget day out in your area?A picnic by Rochester Castle and a walk around Rochester High Street and the parks. It's a wonderful day out. The castle isn't too expensive either. ​How do you budget for big occasions like Christmas & Birthdays?I try to put away a certain amount of money each month so that it isn't such a big issue when December comes. Most of our friends and family's birthdays are in December and early January, so we have even more need to be prepared! Have you got any money saving targets to complete in the next year?I've found it difficult being on maternity leave, having such little income and no income for the last three months. As such, the biggest target at the moment is probably having nothing on either of our credit cards! I'd like to do another sealed pot challenge too, with the goal of saving over £200. Thank you so much for taking the time to answer these questions Laura, I loved hearing about your family life. It is fantastic that you have done a sealed pot challenge. I have never done this but would love to do one in the future! Good luck with your next saving goal.